Just as described, this shower curtain is perfect for creating that Mediterranean or beachy ambiance in your bath. Good quality, fast drying. 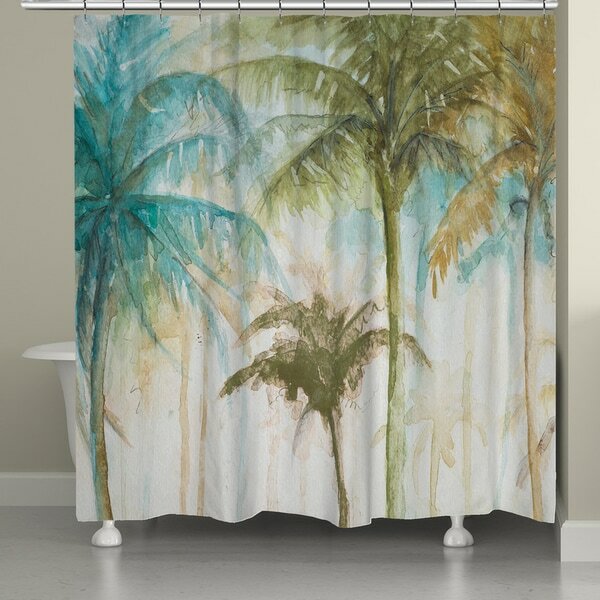 Bring the beauty of a tropical paradise to your bathroom with Laural Home's Watercolor Palms Shower Curtain. This product is digitally printed to create crisp, vibrant colors and images. Loved the photos of this item however, when we put it up in or bathroom to look for paint options we really noticed an odd beige color that looked pinkish. Then upon looking at it further there was no real color to coordinate with the curtain because the right and left sides of the curtain are different color pallets from which to choose a single wall paint color. Sticking with an off white competes with the curtains background. To top it off, the price was on the high side. Ultimately returned it. It is beautiful and looks like a watercolor. 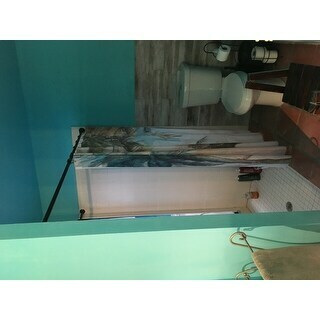 The blues and greens are very nice in this curtain, but in my small bathroom the center palms draw the most attention. They are actually a shade of brown that is very off-putting and overpowers the palms on either side. Will be returning. This curtain is expensive for a shower curtain but it is exactly as shown. Absolutely love how it looks with my beach theme bathroom - actually better than I thought it would be. A smile in the shower! This a beautiful curtain with very subtle colors like a painting. It works well with the ensuite bathroom. It's a little pricey but I would buy again. The picture doesn't do this shower curtain justice. Yes, it is pricey. But, you will love it! Very nice looks just like the photo. The size is 71”x 72 1/2”. great quality and just the upgrade I needed! This is approximately 71 inches x 74 inches. I just measured it it's 71 inches wide by 721/2 inches long. "How tall is this shower curtain? Wide? Please share dimensions. " 71 inches wide by 72 1/2 inches long. "Is it aqua or blue???" The palm trees and water color splash went well with my bath color,lot of blue blend in curtin.only Palm trees I liked. Thank you. Love the colors and the tropical theme! Good quality and love the color scheme! "Is this shower curtain heavy weight waterproof with weights in the bottom." This shower curtain is not weighted and is 100% polyester. The use of a liner is recommended as this curtain is not waterproof.